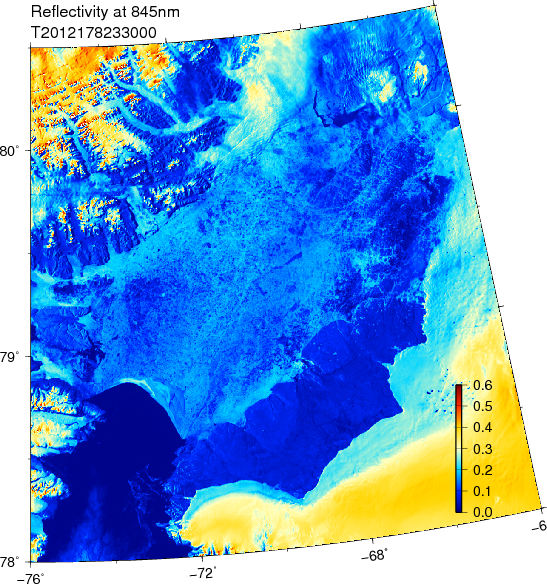 June-30, 2012 MODIS-Terra view of the collapsing Nares Strait ice arch. The separation occured at the location where the hairline fracture developed 3 days ago. The collapse is propagating upstream to the north as the buttressing support on the western anchor point near Bache Peninsula and Pim Island was removed. 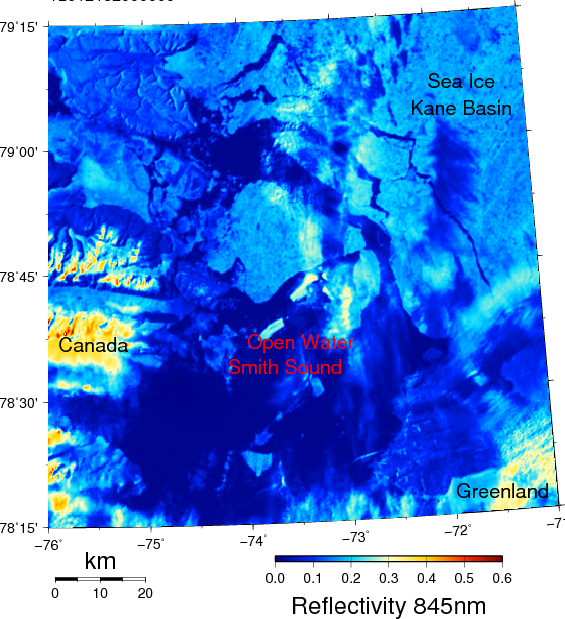 June-29, 2012 MODIS-Terra view of the collapsing Nares Strait ice arch. The separation occured at the location where the hairline fracture developed 2 days ago. The most relevant weather information is from Hans Island near 81 N latitude. 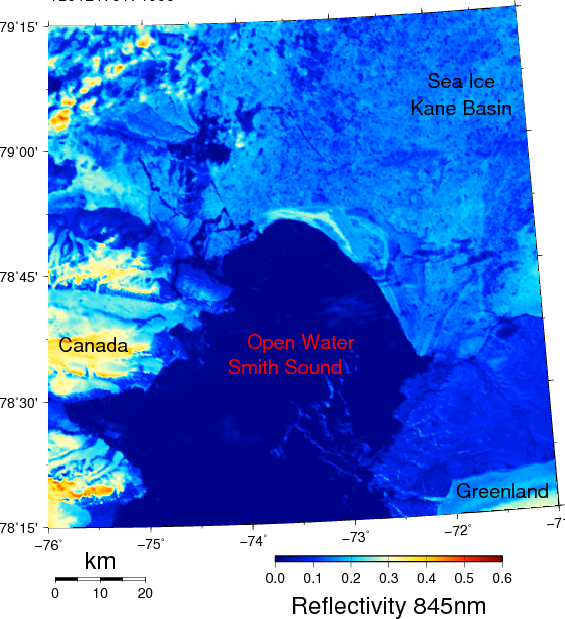 The collapse of the ice-arch in southern Nares Strait began June-27, 2012 with development of a small hairline fracture along the western side of the strait off Ellesmere Island, Canada. 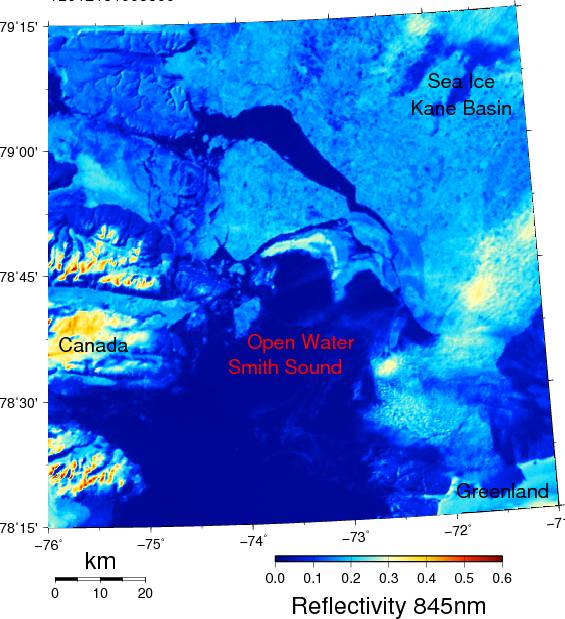 The fracture connects an isolated area of open water off Bache Peninsula, Canada at 79 N latitude. The front between land-fast ice in the north and the open water in the south has moved slightly southward. It has also lost a visible larger piece of ice that before anchored the bridge at its western connection to land. This motion will open the hairline fracture more, accelerating the collapse of the ice-arch. The missing support of the ice-arch on its western side will collapse the entire ice-arch and the previously land-fast ice of Nares Strait will stream rapidly to the south, I predict, before this weekend. Updates (including an animation) will be posted daily at http://muenchow.cms.udel.edu/Nares2012/Kane/. Ice-bridge at southern Nares Strait June-26, 2012 23:30 UTC from MODIS-Terra. 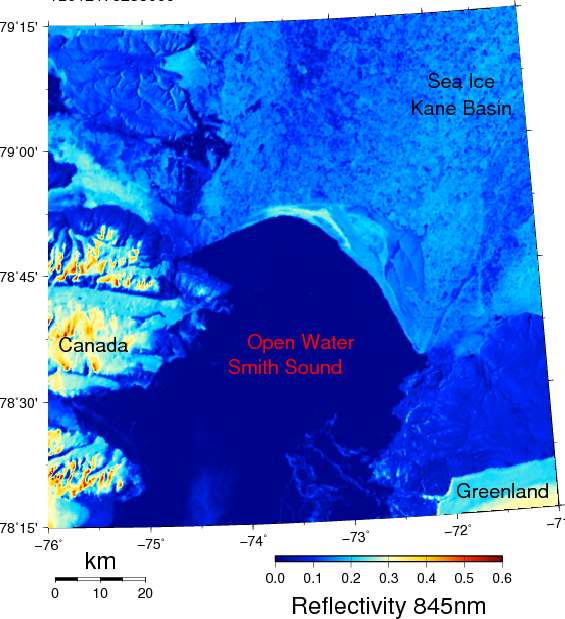 There are no hairline fractures yet along the Ellesmere Island side near 79 N latitude. Greenland is on the right (east), Canada on left (west). Ice-Bridge at southern Nares Strait on June-27, 2012 17:40 UTC from MODIS-Terra. Notice the crack and hairline fractures in the ice along the Ellesmere Island coast near 79 N latitude and 75 W longitude. This collapse happens each year in the summer, though the timing varies from April for weak and July for strong arches. The arch in 2012 lasted longer than the one in 2011. 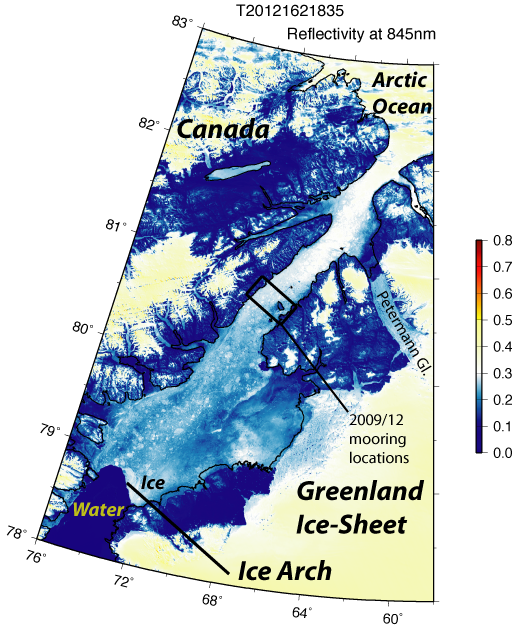 No or only weak ice-arches formed at this site in 2007, 2008, and 2009, e.g., http://muenchow.cms.udel.edu/MODIS/. MODIS-Terra June-26, 2012 prior to collapse. MODIS-Terra June-27, 2012 at the onset of collapse. Note the change near the Canada at 79 N latitude where open waters meets the sea ice. June-10, 2012 MODIS-Terra image showing location of moored array that was deployed in Aug. 2009 to be recovered in Aug. 2012. 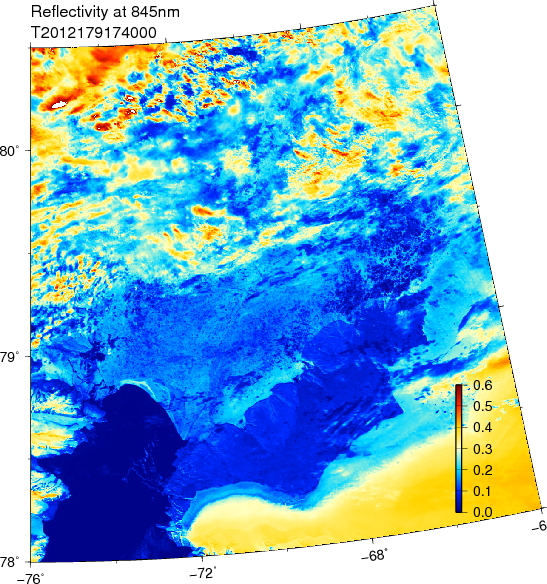 This entry was posted in Ice Arch, Ice Cover and tagged Arctic Ocean, Greenland, ice, Nares Strait. Bookmark the permalink. Hello, Andreas. Is it OK if I repost this on the Arctic Sea Ice blog? I’d be delighted, use anything you like as you see fit. Here it is. Thank you. The sea-going oceanographers are a very small community, so most of us know each other well … and I saw your “Heat Flux” post that I passed along to my students (2 summer interns and a graduate student) as background reading. Good stuff. Would it be appropriate for you to indicate the locations of the instruments you will be retrieving on one of these maps? Our mooring locations are off the map to the north, but I placed a box on a larger map that shows all of Nares Strait on June 10, 2012 and added it to the post. Hello, I came here via Nevens blog. I’ve been interested in the ice arches since reading Kwok’s paper. I was wondering if you had some time to describe the region this southern arch is forming? E.g. why an arch at this spot? Is the water deep here? Is the arch grounded along it’s length? If the arch makes it to July that would seem to be a relatively late date compared with other years in the last decade. What would be the reason for that given that this year the rest of the sea ice seems to be going fast and the sea ice is generally considered much thinner at the moment? I am wondering all these questions myself. The best I could come up with for answers (hints pointing in a direction, really) is what I wrote a few weeks ago at https://icyseas.org/2012/06/11/ice-arches-and-gothic-cathedrals/ where there are large number of interactive physics games to play. Check the links and videos at the end. There are strong structural analogies between Gothic cathedrals and the polar ice arches. That was the long answer, the short answer, perhaps, is that there is a constriction, but I do not really understand this as well as I would like to.